UP FORsale IS A BABY GIRL HOT PINK WITH PLUM EYELASH TRIM TEDDY BEAR HAT. 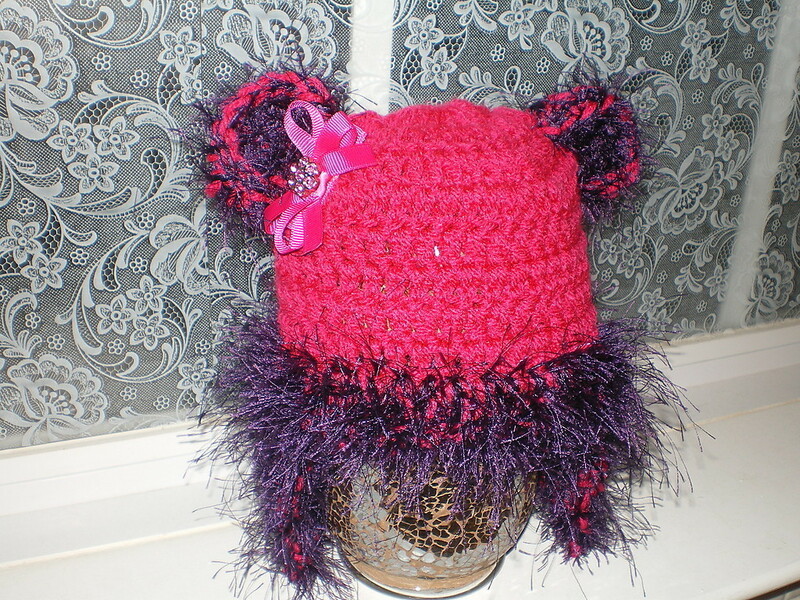 THIS IS A VERY CUTE HAT MADE OF A SOFT YARN. 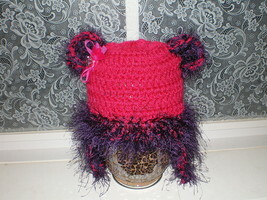 THIS WOULD BE A GREAT HAT FOR YOUR LITTLE ONE'S FIRST PHOTO OR FOR EVERYDAY USE. FOR PHOTOGRAPHERS, THIS WOULD BE AN GREAT ADDITION TO YOUR PROPS. 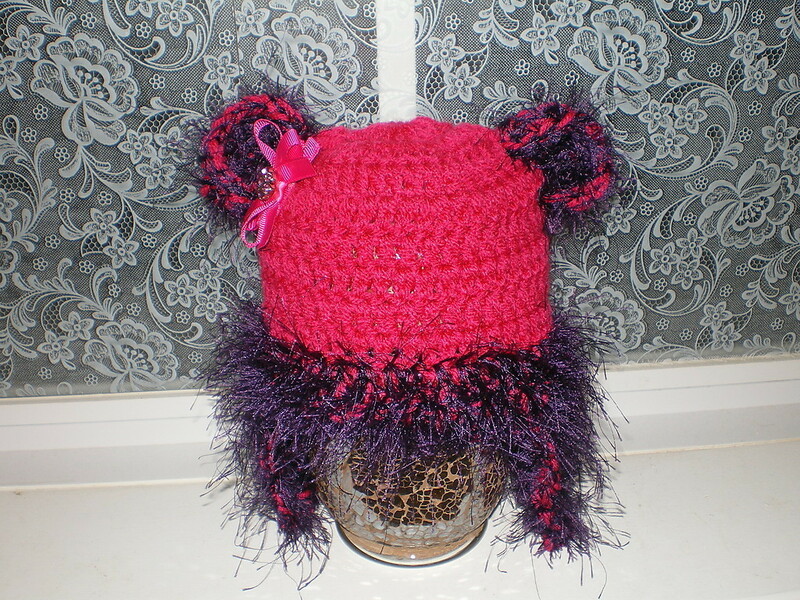 IT IS MADE OF SOFT YARN AND FITS 0-4 MONTHS. IF YOU NEED A LARGER SIZE, MESSAGE ME. ***** PAYMENT ****** PLEASE PAY FOR YOUR WINNINGsale ITEM WITHIN THREE (3) DAYS OFsale END. IF YOU CANNOT PAY WITHIN THE 3 DAY WINDOW, PLEASE EMAIL ME. ON THE 4TH DAY OF NONPAYMENT, AUTOMATICALLY STARTS IN MOTION A NONPAYMENT CASE. ***** FEEDBACK ***** *** I WILL LEAVE YOU FEEDBACK AFTER YOU HAVE LEFT MY FEEDBACK AND I KNOW YOU ARE HAPPY WITH YOUR ITEM. *** ***** SHIPPING ***** I NOW OFFER FREE DOMESTIC SHIPPING IN THE USA. I STILL COMBINE SHIPPING FOR MY INTERNATIONAL BUYERS, WHEN I CAN. INTERNATIONAL BUYERS – PLEASE NOTE: YOUR ITEM WILL BE SHIPPED WITHIN FIVE (5) DAYS AFTER RECEIVING PAYMENT. !!!!! PLEASE !!!!! DO NOT PENALIZE ME WITH LESS THAN FIVE (5) STARS ON SHIPPING TIME BECAUSE IT TOOK LONGER TO REACH YOUR INTERNATIONAL LOCATION. IMPORT DUTIES, TAXES, AND CHARGES ARE NOT INCLUDED IN THE ITEM PRICE OR SHIPPING COST. THESE CHARGES ARE THE BUYER'S RESPONSIBILITY. CUSTOMS FEES ARE NORMALLY CHARGED BY THE SHIPPING COMPANY OR COLLECTED WHEN YOU PICK THE ITEM UP. THESE FEES ARE NOT ADDITIONAL SHIPPING CHARGES. I WON'T UNDER-VALUE MERCHANDISE OR MARK THE ITEM AS A GIFT ON CUSTOMS FORMS. DOING THAT IS AGAINST U.S. AND INTERNATIONAL LAWS. THANK YOU FOR VISITING MIMI'S PRECIOUS DESIGNS. LOOK FOR ME ON FACEBOOK. Powered by Turbo Lister The free listing tool. List your items fast and easy and manage your active items.